>Ameer Zachery<: No Ice Cream? I was craving for some ice cream yesterday. So I decided to go to McDonald for their Cornetto Sundae. I asked a friend of mine to tag along since he live nearby. I know he sweet because he always free for me. Plus, he know he get free ice cream. Hahaha. Anyway, the usual place is SS15 drive thru. So we went there and to our surprise their machine was broken. My friend make the funniest sound until it startled the cashier. I, of course can't stop laughing about it. No ice cream here. Then the next nearest McDonald is at SS15 near the INTI College. Go there also no ice cream. We were like WTF. How come both also no ice cream one. They don't like us is it? Haih. So last resort is eiher go to Sunway Mentari McDonald or LDP Sunway McDonald. We try out the first one dulu since it on our way. 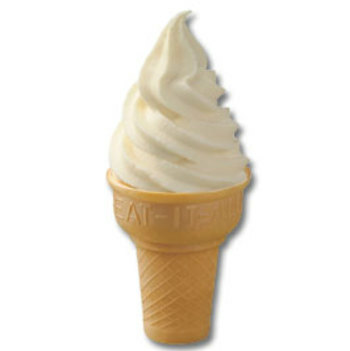 I was excited already when I saw someone was eating the cone. Yeay. Now no seat pulak. Lucky got people ciao so we can buy the ice cream. I think the cashier girl a bit blur or my English too powderful already. I told her I want Cornetto Sundae, she said ChocoTop. Then when she got what I was saying, she go make Cornetto McFlurry pulak. Haih. Nevermind lar. At least I got to eat my ice cream.